We observe May as National Cancer Research Month to celebrate the tremendous advances that have been made in our understanding of cancer and ways to fight it. It’s also a time to rededicate ourselves to the enormous tasks that face us still. Make no mistake, we are infinitely better off than we were 20 years ago in our grasp of the basic biology of cancer, and we also have much better treatments. But there is still a long way to go before we fully understand the many forms and expressions of this terrible family of diseases. That’s why research at all levels, basic, translational and clinical is so important. Pat Morin, PhD, speaks at the SU2C Scientific Summit 2016. Photo by © AACR/Todd Buchanan 2016. The AACR is proud to be the Scientific Partner to Stand Up To Cancer (SU2C), a major force in cancer research today. SU2C is an initiative of the Entertainment Industry Foundation (EIF), based in Los Angeles. It harnesses the industry’s resources to engage the public in support of a new and collaborative model of cancer research and to raise awareness of cancer prevention and other issues. SU2C has successfully launched 19 Dream Teams, two Translational Research Teams, and 36 Innovative Research Grants with funds committed by philanthropic, organizational, corporate, and individual donors, as well as non-profit collaborators. The AACR provides expert peer review, grants administration, and scientific oversight of team science and individual investigator grants. 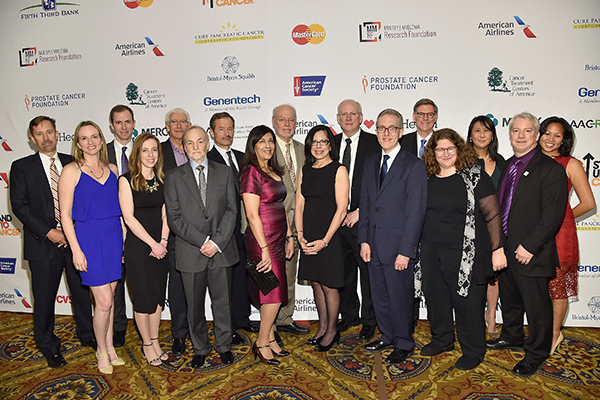 SU2C-affiliated scientists and AACR scientific staff posed at a recent event in New York. Back row, left to right: David A. Tuveson, MD, PhD, Cold Spring Harbor Laboratory; Peter B. Dirks, MD, PhD, Hospital for Sick Children, Toronto; Peter A. Jones, PhD, Van Andel Research Institute; Lewis C. Cantley, Weill Cornell Medicine; Phillip A. Sharp, PhD, MIT, chairman of SU2C Scientific Advisory Committee; Ray DuBois, MD, PhD, Medical University of South Carolina; William N. Hait, MD, PhD, Janssen Research & Development; Sung Poblete, RN, PhD, SU2C CEO; Jenine Sanzari, PhD, AACR. Front row: Emer Smyth, PhD, AACR; Shannon Maude, MD, PhD, Children’s Hospital of Philadelphia; Stephen B. Baylin, MD, Van Andel Research Institute; Feyruz Rassool, PhD, University of Maryland; Elizabeth M. Jaffee, MD, Johns Hopkins Kimmel Comprehensive Cancer Center; Jedd D. Wolchok, MD, PhD, Memorial Sloan Kettering Cancer Center; Dana Pe’er, PhD, Columbia University; and Pat Morin, PhD, senior director, Scientific Review and Grants Administration, AACR. Photo by Mike Coppola/Getty Images for EIF. Each Dream Team attacks a specific problem in cancer research and works on a collaborative basis. They have leaders, co-leaders, and members from different institutions. Some teams are cross-country and others are transatlantic, with leaders in the U.S., UK, and the Netherlands. Stand Up To Cancer Canada also recently formed and is supporting two pan-Canadian teams. These are not small groups. Altogether, they have comprised more than 1,100 researchers, from 131 leading institutions around the world. Collectively, they are involved in over 160 planned, launched, or completed clinical trials, in which more than 7,500 patients have participated. Some of the most famous names in cancer research today are involved in SU2C-supported research. Stand Up To Cancer did not invent the concept of collaboration in cancer research, but has made it an absolute priority. 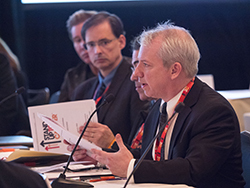 SU2C’s Scientific Advisory Committee is led by Phillip A. Sharp, PhD, Institute Professor at the Koch Institute for Integrated Cancer Research at MIT and a Nobel laureate, and the SAC has always made funding recommendations based on scientific impact and on the likelihood that the research will benefit the patients in the short term. The U.S. Food and Drug Administration (FDA) accelerated approval of a drug to treat advanced breast cancer in post-menopausal women, Ibrance (palbociclib), after the SU2C Breast Cancer Dream Team showed dramatically increased survival in women taking it. Based on work by the SU2C Pancreatic Cancer Dream Team, the FDA approved a new combination of drugs that enables longer survival in patients with advanced pancreatic cancer. They have also developed a new method of identifying pancreatic tumors that have spread to the brain and liver, which could significantly aid in diagnosis. The SU2C-CRI Cancer Immunology Dream Team is using a new approach called adoptive cell therapy that takes a patient’s own immune cells, modifies them in the laboratory into cancer killing armies, and then returns them to the patient. The team is running some of the first clinical trials combining adoptive cell therapy in combination with checkpoint inhibitors. The SU2C Cancer Epigenetics Dream Team also conducted a clinical trial of an experimental drug for certain types of leukemia, quickly moving the drug from the lab to its first use in humans. The SU2C-MRA Melanoma Dream Team received the first FDA approval for a new approach to rapid genetic profiling of melanoma, which the team is using in a national clinical trial to match drugs to individual tumors based on their genetic characteristics –an example of “precision” medicine. Founded eight years ago by nine women whose lives had been deeply affected by cancer, Stand Up To Cancer has become a world-class initiative with the highest scientific standards. It is serving as a model for other philanthropic endeavors. Its approach to translational research is an important complement to the basic research that is critically important to our understanding of cancer.